That’s the vision behind the latest efforts of actor John Ratzenberger (think Cliff from the TV show Cheers) to promote manufacturing. In this nearly 3-min. interview with Fox Business, posted to YouTube, listen to Ratzenberger discuss the initiative of his non-profit organization, Foundation For America. Its goal: to have schools teach the importance of manufacturing in classrooms. Kicking things off is a $1 million grant given to the Governor of Georgia to help expose middle- and high-school students to “the beauty and attractiveness of working in manufacturing,” says Ratzenberger. “Problem-solving and learning have been taken away (from our youth); this is the first generation in the history of the world that’s been raised without the knowledge of tools,” Ratzenberger stresses. Uncover hidden design flaws before prototyping with accurate stamping simulations. DYNAFORM is a simulation software solution that allows engineers to accurately simulate stamping and Predict Formability Issues, Reduce Development Time, Validate Die Design, Improve Efficiency and Increase Profitability. Simulating every detail during the design stage ensures high quality formed parts and efficient manufacturing processes. Hilma's hydraulic roller bars lift the die for easy rolling in and out during the die change process. Used in sets, the bars are ready to ship, in standard T-slot widths, and in four lengths. > How ERP-Savvy are You? Register now for the 2015 Manufacturing ERP Experience, scheduled for April 14-15, 2015, at the Donald E. Stephens Convention Center in Rosemont, IL. The event includes software demonstrations from leading suppliers, case-study presentations describing successful software-implementation projects, and keynote presentations on implementation strategies, vendor selection, training and other topics. Among the case-study presenters is April Kennedy, purchasing manager at Cordeck Building Solutions, Kenosha, WI. Cordeck employs its ERP system (from xTuple) to manage the processes used to manufacture corrugated steel decking, flashing and other building-construction accessories. The firm has found that the open-source ERP system readily handles all of its requirements for accounting, sales, inventory and manufacturing. Upon installation, the system resulted in a direct IT-expense savings of more than $10,000 per year. Most recently, with the addition of three new locations in 2014, Cordeck has deployed cloud-based xTuple. 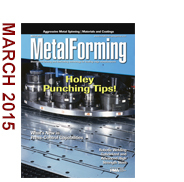 Visit www.metalformingmagazine.com/erp to learn more and register to attend. In addition, stay in Rosemont for an extra day to attend, on April 16, the half-day ERP Software Selection and Implementation Boot Camp. It will focus on the steps necessary to select the right ERP software, negotiate with vendors, document business processes, increase ROI and more. Visit www.metalformingmagazine.com/erp/boot_camp.asp for details and registration information. Trends in data reporting, cellular manufacturing and good-part verification drive advances. Tier One/Tier Two automotive metalformer Wellington Industries leverages its manufacturing IQ to become a prominent supplier of robotic-welded (resistance and MIG-braze) front-end modules for some of the most popular platforms. Roll Forming Machine Operator (IL) / Johnson Bros Metal Forming Co.